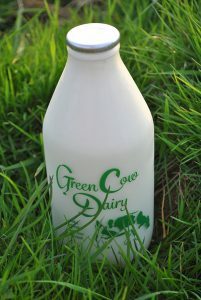 We deliver delicious fresh milk products from our own herd of cows here on Plushayes Farm, Liskeard, Cornwall. 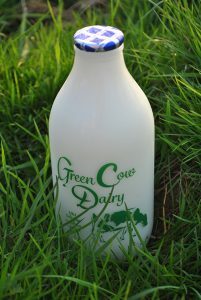 Our new venture based on traditional dairying is something of a rarity, as we not only produce the milk, we process it (gently pasteurised), bottle it and distribute it direct to our Cornish customers right here on the farm. That means the milk goes from our herd and is with you fresh the next day. You really can’t get fresher or more local than that! 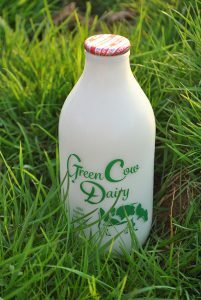 We currently supply whole, semi-skimmed and skimmed milk in 1 pint glass bottles, priced at 80p per pint. We also supply other local produce, including honey, chutneys, eggs, bread and meats. Please get in touch if you have any specific requirements. We will be constantly adding to our range, with cream, butter, yoghurt, cheese all coming soon so keep an eye on this page for more details. If you are looking for a local Milkman in our delivery area and would like to try a sample pint please get in touch, either by phone or via our online registration system. We are proud to say that we source almost all of our products locally, or at least from within Cornwall, such as honey from Blunts near Saltash and organic chicken eggs from the Penbugle family near Liskeard. So you can be reassured that the food you put on your table has the lowest food miles possible. If you are a producer looking for a new outlet, please get in touch as we may be interested in distributing your produce on our round. As we have found many people no longer want to have cash to hand or wait in for a collector we don’t normally collect at the doorstep anymore. However if you don’t have the internet we do have the facility to set up your account with another billing address so that a relative or friend can process payments online for you. Please contact us if you want to discuss any other payment method.